Here comes #32 in the [coaster collection] here on the blog with this one from Disney's Contemporary Resort that features the neat retro-ish logo with the monorail running right through the hotel. The most recent coaster I posted was one from Half Acre Brewery. This is also the #10 of the collection that relates to Disney. 10/32 or 31% are Disney-related with the most recent one from Enzo's Hideaway that I posted back in April of this year. I found this in a pile of coasters that I had stashed in my office closet after cleaning it out over the Thanksgiving break. It is now sitting on my desk along with a few others and will get used for a while before being discarded. 1. The standard one you see in your rooms @ Walt Disney World resort hotels. 2. This black and white one from the original Disneyland Resort Hotel. 3. This *new* Walt Disney World resort hotel version that updates the look of #1 above. 4. One from the Irish pub Raglan Road restaurant in Disney Springs. 5. From inside the Magic Kingdom comes this one from the Skipper Canteen. 6. Right outside the Boardwalk Inn Hotel is where we got this coaster from the Flying Fish restaurant. 7. Back in Disney Springs, I found this one from the Boathouse. 8. Back on The Boardwalk is this one from the Abracadabar. 9. Down in the bowels of Disney Springs was this one from Enzo's hideaway. 10. 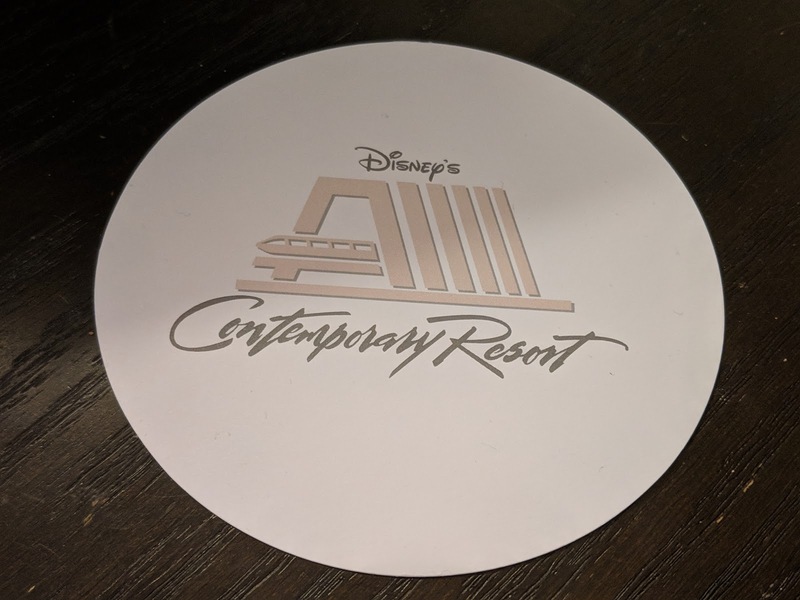 Now this post about the Contemporary Resort hotel coaster.